If Shale Is So Bad for Washington County, Why Is Health Improving? The Southwest Pennsylvania Environmental Health Project says the “shale industry continues to impact” Washington County, yet health there is much improving. It’s that time of year when every non-profit in the land begs for money in the hopes those who’ve done well might want an extra tax deduction for something they already support. My e-mail box is full of such solicitations, including several from groups I don’t support at all who somehow got my name; groups such as the Southwest Pennsylvania Environmental Project or EHP. The EHP is nothing more than a fractivist junk science tool financed by the Heinz Endowments as far as I’m concerned, but Raina Rippel, the EHP’s Director just wrote me to say “EHP is 100% committed to being there” for me. She says her “team of researchers and public health professionals have lived and breathed the air of the communities we struggle to protect.” She asked to join her, and stay with her, in her battle—by donating, of course. Needless to say she won’t be getting money from me and for good reason, because the health of the community where she’s located, in Washington County, the middle of a shale region, is already improving under shale development. 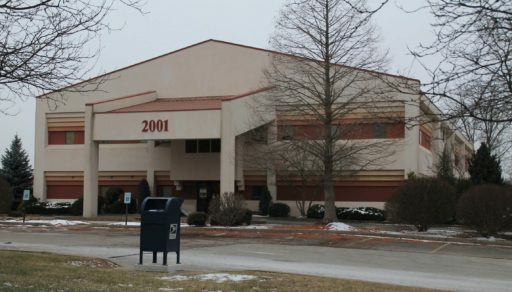 The building where the Southwest Pennsylvania EHP offices are located. It’s taxed asa having “all public utilities.” Does that include natural gas heat? The shale industry continues to impact many communities in old and new ways, and shows signs of ramping up significantly in 2018. With FERC using eminent domain to push pipelines through at a fast and furious pace, contrasted with more than a few hard-won local pipeline victories, sometimes it’s hard to know which way is up. EHP has made great strides in pioneering a public health response to shale gas development. However, the scope of the problem, regionally and nationwide, is daunting. And our ability to protect communities nationwide is limited by the resources on hand. The facts, though, tell a much different story. Those facts are readily obtainable from the Pennsylvania Department of Health County Health Profiles. The 2010 and 2016 profiles, in fact, provide a nice comparison of health conditions in Washington County at the beginning of the shale revolution and today. The rates, except for obesity and smoking (which are in percentages of population), are all expressed in deaths per 100,000 persons. Notice the declines in every category with the exception of Chronic Low Respiratory Disease and Septicemia. Also, before you yell “see, I told you so” at the top of your fractivist lungs on that CLRD number, note smoking and obesity, which have nothing to do with fracking, but contribute greatly to CLRD, have risen. Three of the six shale counties — Bradford, Lycoming and Susquehanna—experienced significant declines in the CLRD death rates between 2009 and 2014. Their rates were almost at or below the national rate by 2014. Tioga’s rate also declined from 2009-2014, but its rate was slightly above the national rate at 49 by 2014, and Washington’s rate also was 49 by 2014. Finally, a look at the numbers by year indicates they bounce around a lot, having been 43.4 for the 2006-2008 period measured in the 2010 report and then declining to 41.6 for 2009-2011, after the onset of the shale revolution. 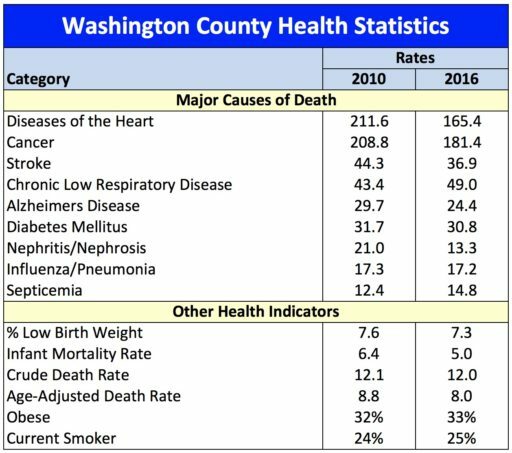 The Center for Disease Control (CDC), in fact, indicates the national figure for 2014 was 46.1, so anyway one cuts it, Washington County’s data indicates nothing unusual with respect to CLRD. Much more importantly, the state health data as a whole demonstrates Washington County’s health has been improving throughout the shale revolution, despite rapid aging, the smoking, the obesity and all the rest. That’s quite a feat for a county with a lot of folks who worked in the coal industry. There’s a reason, it turns out, that Raina rains rhetoric, rather than facts, in her fund-raising e-mails. That’s what Heinz pays her to do, of course. Send your donations to the local hospital instead of her phony political clinic. I agree that donations to healthcare facilities will be much more useful to the local populous than the vicious, false, ranting of the fractivist and anti-pipeline folks. During this extreme cold wave, I hope all there have ample heat for their homes and businesses. I noted a report yesterday that oil and coal usage had surged in the current cold wave. It would be far better to have more natural gas for heating and electric generation to minimize harmful emissions. Can you image the consequences, if folks there had to rely entirely on solar, wind and/or other alternatives at this time of the year? Tom I really appreciate your website and the fact that you have to keep reminding the ignorant and the lying and Prophet ears of the Sierra Club of the truth. But I think at this point it’s getting ridiculous, everybody that anybody knows natural gas is the way to go.